Over the past few years HDR processing has becoming very popular. A term has even been coined for photographers who first discover HDR then basically only ever make HDR images from then on, "falling into the HDR hole." It took me a long time to come around to realizing the benefit of HDR because, frankly, all the HDR images I saw online I thought were horrid, and I still personally do not care for a majority of HDR images I see. This is of course a heated topic in the photography community. However, for this photography tip, I just want to demonstrate the power HDR has to produce very detailed & dynamic images. Many times, using aperture priority mode will result in a very good looking image. The top photo is the result of setting my Nikon D300 to f/11 in aperture priority mode (A - Nikon, Av - Canon). Aperture priority produced an ok looking image. I set my focus point on the middle elbow of the lowest branch using matrix metering mode. Thus, the priority for the sensor was exposing the tree well. You can see pretty good detail in all the tree branches, the grass and even the leaves. However, there is virtually no detail in the sky at all. Using a single exposure, one has to choose whether to expose for highlights or shadows, and if the highlights are much brighter than the shadows, one of them will have to be sacrificed to a certain degree. In this case, the sky was sacrificed in order to expose the tree better. HDR processing overcomes this by using a series of bracketed shots, some overexposed and some underexposed along with the base image (what aperture priority thinks is best). For this Gumbo-limbo tree shot, I took 7-bracketed images, of which you can see the brightest (+3 exposure) and the darkest (-3 exposure). I ommitted the other two exposures for blog post space reasons, but those would just be a little less bright and a little less dark. Using Photomatix Pro 3 to combine all seven of those photographs, taking the best exposed parts from each, the final HDR image is able to show the tree in even more detail than the single aperture priority exposure shot and also detail and color in the sky as well. 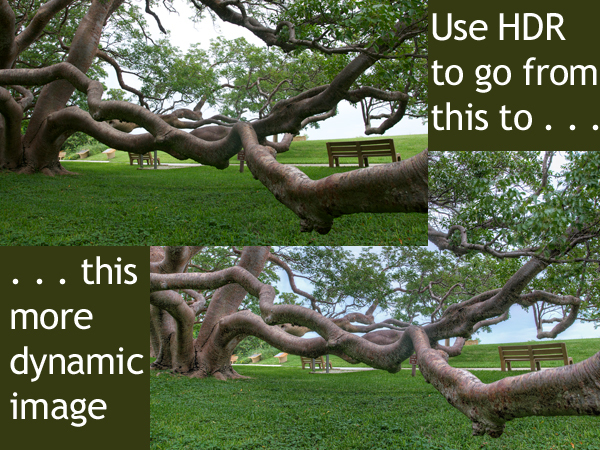 Therefore, when trying to photography a scene that has a high dynamic range (HDR), taking a bracketed series of shots and combining them into one final HDR image can produce results that no single exposure can. This is the advantage of HDR processing. Reserve your own 1-on-1 DSLR Photography Lesson with Jason today to learn how to make HDR images like this one!